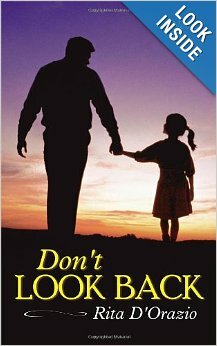 Don’t Look Back is a very good novel that begins in the late 1960’s. It is about Katerina Balducci, who grows up in a very dysfunctional family in New York. She has a 15 year-old sister, Simona, and a 13 year-old brother, Tony. She has a love/hate relationship with her mother and a loving relationship with her father and Zia Adrianna. She loves the Beach Boys and fashion. She is feisty and lovable. The story is both funny and tragic. When tragedy strikes, Katerina stays strong and is an inspiration to her sister. The story flows very well and will keep you on the edge of your seat page after page. I really enjoyed reading it and look forward to the sequel. The story is geared toward older teens and young adults, however, anyone would enjoy it. I love the book and am long past the young adult age! So, grab a cup of tea, sit down, read Don’t Look Back and enjoy! Read Liz Hughes’ thoughts on more books below. Wow! 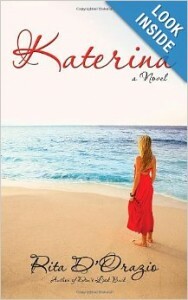 Katerina is the sequel to Don’t Look Back. That was very good and leads into Katerina. I would recommend this one for older teens to adults beyond their twenties as I am way beyond my twenties myself! I enjoyed this book very much. Katerina starts out with Katerina and her daughter, Valentina, at the 50th anniversary Beach Boys concert for her 50th birthday, a present from her brother Tony. Katerina begins her story from chapter one and from then on fills in the many years from the moment she discovers that her Papa was not her biological father. She also learns from her mother why her Mama never showed her love. As the story progresses, it flows through different ages so smoothly that you are never left wondering if you missed something. She tells of her marriage to Stefano and the birth of her daughter. She talks of the age progression of her parents and her husband’s parents and the death of her mother and father-in-law. The easy way the story flows through all the life’s events and milestones will keep you on the edge of your seat for page after page. This book has humor, love, tragedy and suspense. I highly recommend Katerina. It is a well-written, beautiful love story that will have the reader crying tears of happiness! 25 Sense is a very good short novel about Claire. A young woman goes to New York to work on a television show and has a passion for writing. She falls in love with her married boss and wants to believe that he will love her in return. However, he has no intention of leaving his wife for Claire or any of the other women he is fooling around with. When the show in New York gets cancelled, she moves back to Los Angeles. She falls in love with Justin, who she also worked with, but who is single, and who is a very sincere person who has feelings for Claire. She also spends time figuring out what she has done wrong and prioritizing her life. 25 Sense is funny, sad and keeps the reader engaged. I highly recommend this ebook. Rogue Alliance is a very well written suspense thriller that will keep the reader on the edge of their seat for page after page. Shyla is a homicide detective from the Los Angeles area, who is given a promotion and transferred to Redding, CA to take down a very powerful drug lord, Victor. Brennan was kidnapped when he was 16 years old and raised as a guinea pig in an institution. He has been genetically altered to crave and drink blood; without it, he will die. He is set free by Victor to be his bodyguard. Shyla meets Brennan when she goes undercover to build a solid case against Victor. Shyla has had a very difficult past in Redding and she has to face her fears and her past. Shyla and Brennan fall in love only to find out that there is another protein needed to keep Brennan alive. With suspense and thrills on every page, Rogue Alliance, will keep the reader interested and wanting much more. 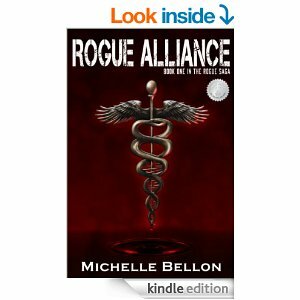 I highly recommend Rogue Alliance by Michelle Bellon. I know you will love it, as I did.